Come to a Conversation Class ! No experience necessary. If you decide to enroll, that will be the first class of your program. If not, just pay $15 for the one class. Need to come see us? 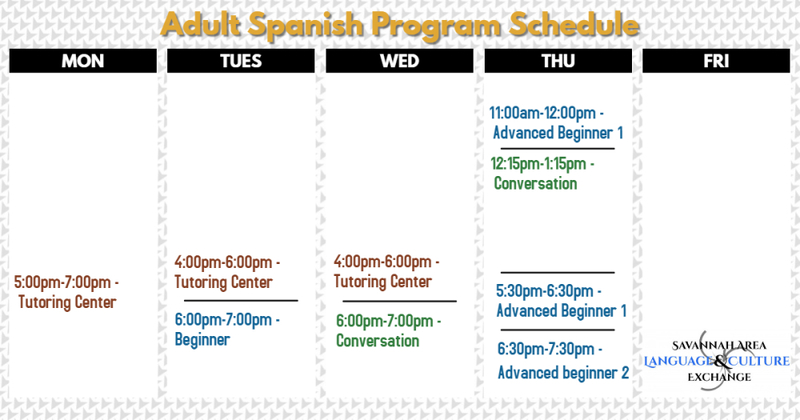 Our Spanish classes are designed to be a complete program that combines the best of private tutoring with the best of group learning in the form of small group classes. Each class is limited to only 8 students to allow us to customize content and pace to the needs of each group. If you're short on time or on a tight budget, we have options for you! Drop in to the tutoring center for just $20 per visit. This means you can dedicate whatever time you have, when you have it. Maybe that's 3 hours one week and 20 minutes another. We'll help you pick out a self-study book or online course and give you the personal help you need along the way! But a tight schedule or budget shouldn't mean you miss out on the benefits and camaraderie of a group class, so you can drop in on conversation classes for just $15 per class too! Mix and match to get the program that works for you. No more excuses. Learning a language is finally truly accessible to EVERYONE!